Akai Synth Station 25 for iPhone and iPod Touch - Transform your iPhone into a music production studio. The Akai Synth Station 25 transforms iPhone or iPod touch into a portable music production studio for mobile music creation. This MIDI keyboard controller gives your handheld device a two-octave set of piano keys and professional audio outputs, and it works with the Akai Professional SynthStation Studio app. The Akai Synth Station 25 is powerful enough for professional musicians, yet virtually anyone can use is to easily create music. This 25-key synth keyboard features a built-in dock for iPhone or iPod touch. The Akai Synth Station 25 gives you two octaves of velocity-sensitive, synth-action keys, pitch and modulation wheels, and octave up and down and sound-bank buttons. The Akai Synth Station 25 has a stereo pair of RCA line outputs and a headphone output for connection to recording and sound reinforcement systems. You can use the Akai Synth Station 25 with Akai's SynthStation Studio app as well as virtually any MIDI music software on your computer or with MIDI hardware devices such as sound modules, samplers, and MPCs using its USB/MIDI output. Available exclusively through the Apple App Store, SynthStation Studio gives you three powerful synthesizers for creating and modifying sonic textures used for melodies, chords, and bass lines. Built around Akai Professional?s history in synthesis and drawing on the newest MINIAK synth, the SynthStation Studio app sounds great and offers wide-ranging sonic flexibility with its virtual analog synthesis. The Akai Synth Station 25 transforms iPhone and iPod touch into a professional musical instrument. Craft your musical ideas wherever you are. 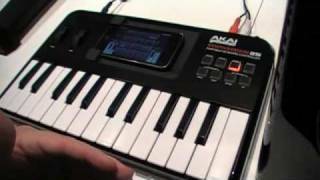 Considering purchasing the Akai SynthStation 25 for iPhone and iPod Touch? Have questions? Ask people who've recently bought one. Do you own the Akai SynthStation 25 for iPhone and iPod Touch? Why not write a review based on your experience with it. 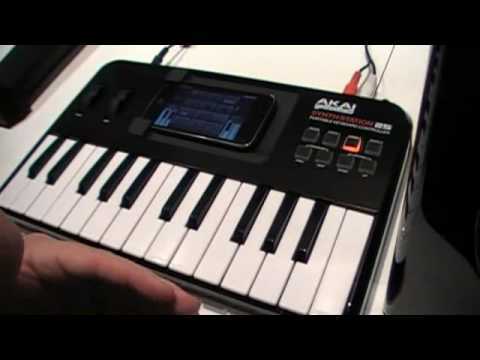 Seen a video for Akai SynthStation 25 for iPhone and iPod Touch online or have you own video? Check out Akai SynthStation 25 for iPhone and iPod Touch on DJkit.com!